Four hours before poll-closing time in the much-anticipated Texas Senate race, Beyoncé – who is still a registered voter in her home state of Texas – took to Instagram to weigh in. 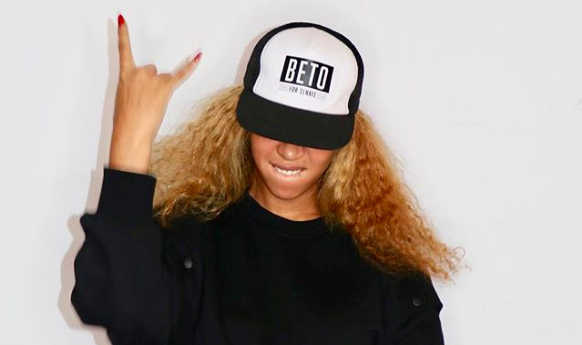 In a series of three posts, in which the pop superstar dons a "Beto for Senate" trucker hat, Queen B left little speculation as to which candidate she's supporting in the 2018 midterm elections: Beto O'Rourke. "I'm feeling grateful for everyone before me who fought so hard to give us all the right to have a voice," the star wrote in a caption accompanying her gif. "We can't voice our frustrations and complain about what's wrong without voting and exercising our power to make it right. We need you. We all need each other, because when we are truly united we are unstoppable." O'Rourke, a charismatic El Paso-area congressman, has emerged as something of a political rock star for Democrats nationwide, as he attracted a following as large and passionate as it is unlikely in the Lone Star State. So tonight, as Americans keep a close eye on the unexpectedly tight race between O'Rourke and Tea Party favorite Sen. Ted Cruz, perhaps it stands to reason that one rock star is coming out in support of another. A lot of Democrats are, after all, "Crazy in Love" with Beto. The question, however, is whether Beyoncé's endorsement is coming too late, or whether it's just the thing to mobilize the Beehive to come out to the polls and fill in the little circle "in the box to the left" of O'Rourke.